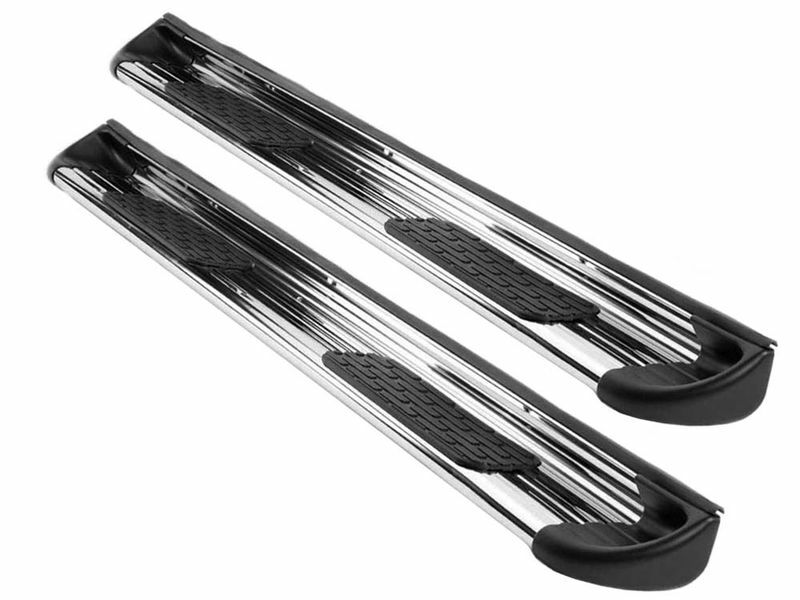 Ionic 7" running boards are made of 304 stainless steel. They come with a Limited Lifetime Warranty. The 7" wide running boards provide a safe step for everyone in the family. Ionic 7" Stainless Running Boards are perfect to make getting in or out of your truck easier and safer. With a huge 7" step, they add to the look of today's bigger pickups. Made with durable 201 stainless steel, they're able to handle as much as 400lbs without breaking a sweat and Ionic backs them up with a limited lifetime warranty. Each set of Ionic stainless steel running boards features a mirror-bright polished finish with high quality, non-slip step pads that provide superior footing. Molded end caps and a backsplash function as mud deflectors to keep your steps clean and dry. Installation is also made simple due to the custom brackets designed by Ionic to best match your vehicle. The mounting brackets are pre-attached to the boards and are designed to use the factory holes of your vehicle. No drilling is required for most applications, which makes getting them onto your pickup easy and hassle-free. The brackets are also powder coated to ensure complete durability. Ionic 7" Stainless Running Boards are the way to go if you want a big, bold look with a time-tested running board design. Order yours today!